In the formulation of the design concept of the new office, D/DOCK opted for a playful approach in 2016, in which energy, inspiration and brand experience resulted in a design with the focus on the employees: Make it personal. Those who enter the office can immediately feel the passion of the organization: travel, the weather and the community. The result is a work environment in which the traditional office floor is eliminated, where you are motivated to make a journey through the office. Remarkable about the interior design is the recycling of existing materials and furniture. To this end, D/DOCK collaborated with Furnify, a design collective gives second-life furniture a new look, in this case one that matched the identity of Zoover. 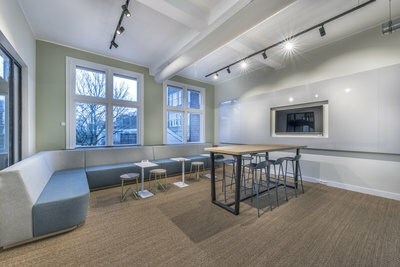 The ground floor serves as a social gathering place where communication and interaction are central. The traditional front desk has given way to an informal open kitchen, where the hostess welcomes the guests and employees. Here, you’ll find the only coffee corner, where employees start and end their day: this is where people meet and inspire each other. 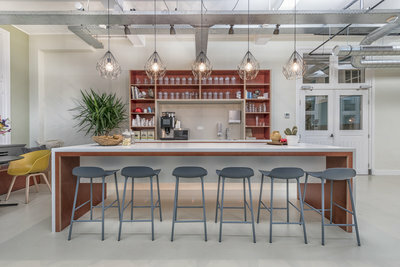 The area with the focus on collaboration is the huge eat-in kitchen in the back of the room, where employees can enjoy a delicious and healthy lunch. In addition, this area offers creative and informal meeting facilities. Swinging doors connect this area to the large garden, which is unique in the Amsterdam downtown area and every other work environment. “Zoover an Weeronline: two major brands, one company. The common denominator of these two brands is the employee, in which it is considered how he / she can perceive the most possible experience from the core value “creating impact on the lives of people”. The effect of this is also reflected internally: everything is initiated by the employees. It is an environment that adjusts to the people using it”, says Irene Snel, Senior Interior Designer at D/DOCK. From the ground level, one takes the monumental stairs via the staircase, which serves as a connecting element for all the floors. 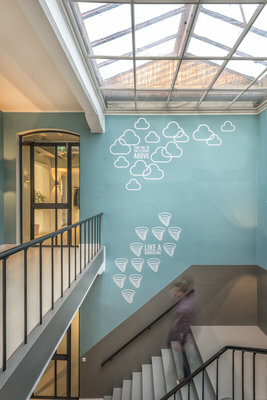 On your way up, you’ll see the brand story on the walls, in which the weather is the leading factor, a nod to Weeronline. In this building, a lot of graphics have been used: all with a funny twist, focused on travel and weather. You’ll find them everywhere. All carpets throughout the building, for instance, have a pixel art, inspired by global graphical styles, such as Aboriginal and Maya art. 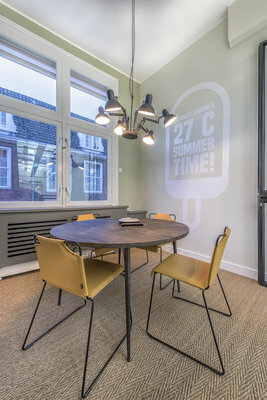 The work environment is fitted with the overall Summer vintage style which is applied to the office like a filter and was designed based on concepts such as cheerful, playful, authentic, fun and non-corporate. 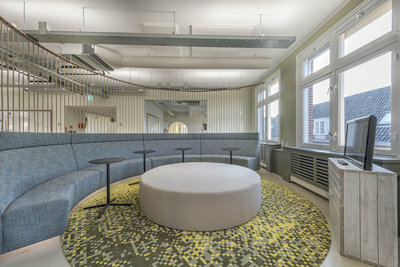 With various settings, the work floor has been designed in such a way that every one can work both individual and in teams, at traditional desks and large robust dining tables, alternated with informal living room-like seats and funny settings. Because of the large windows, the floors are inundated with daylight, which makes working a very pleasant experience. Distributed across the building, you’ll find brainstorm areas and small meeting rooms; furnished as comfortable hubs. 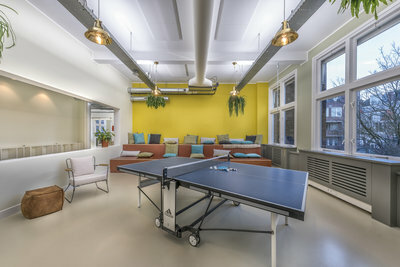 An example of these areas is the re-energize rooms: here you’ll find a stage with pillows and various games, such as a table tennis table. These areas are also used for big presentations or workshops, but in an informal setting. In addition, these are also the areas where employees can brand themselves and where mutual contact between the employees is, once again, central: by bringing souvenirs, personal photo frames and a map with push-pin tags at the wall: a collection of ‘who has been where’. 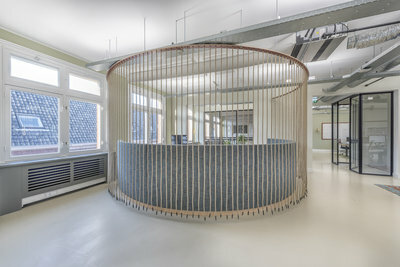 “D/DOCK created a beautiful and inspiring office. It has tremendous impact on our internal collaboration, the wellbeing of our employees and it contributes to success in finding great employees. We are very happy with it”, says Philipp Goos, CEO at Zoover/Weeronline.